"a group of people living in the same place or having a particular characteristic in common." "a feeling of fellowship with others, as a result of sharing common attitudes, interests, and goals." As we link together and join on another coffee date (thanks to the wonderful ladies from Oh Simple Thoughts and Wetherills Say I Do) we are challenged to think about community and what exactly community means to us. I was actually reading and reflecting on this verse not too long ago and I literally highlighted and made all sorts of notes in my Bible just to remember how important these verses are. I absolutely love it. It is so powerful to me and it really tells the love and compassion that I need to always remember to have for my neighbors. Two are better than one. Period. Why is it hard to pursue community or open up to others? What does it look like to "live in community" with other believers and non believers? Why is community important to you? What does it look like to love your neighbor? To me, community is all about bonding. It is about coming to one another to literally put down our thoughts. It is to be with one another through the hard times, the easy times, the worst of times and the best of times. God designed community and it is to be enjoyed between one another. To build a community, you literally have to invest. You have to invest time and you have to invest deeply into one another's lives. I believe there are two hard parts to finding community. One, you have to understand that community is not always pretty. Two, you have to open up to the true you. Sometimes it is so easy to show the "perfect" you. The wonderful marriage, the perfect job, etc, etc. Ladies, nothing is perfect. Days with your husband or significant other are going to be tough. Days at work are going to be so hard to the point of just giving up. If we have no community with others, then it can be so easy to carry all these painful feelings alone...and that is not good for anyone. Invest deep and open up to one another. Invite one another in your homes just to have a night for ice cream and venting. A community will be built and feelings will be relaxed. To me I think that "living in community" should be done with other believers. This way, you can grow stronger with others who are on fire for Christ. But, never turn away an unbeliever. Come together as believers, build stronger faith, compassion, love for others and love for Christ, then pull in non believers so they too may see what Christ is all about. Since we joined our church last Sunday, I am signing up for many serve areas throughout our church but one area I am particularly excited about is a women's community group I am going to join on Sunday. We will just meet at each others homes, dive deep into a particular topic, enjoy snacks and just build a community with one another. Some days we will just go serve and be the light throughout our city. I think if you are a member of a church or not, it is so important to find a community of women to spend time with, to open up to and to serve with. I was reading what the sweet Holly posted on this topic and she literally nailed it. 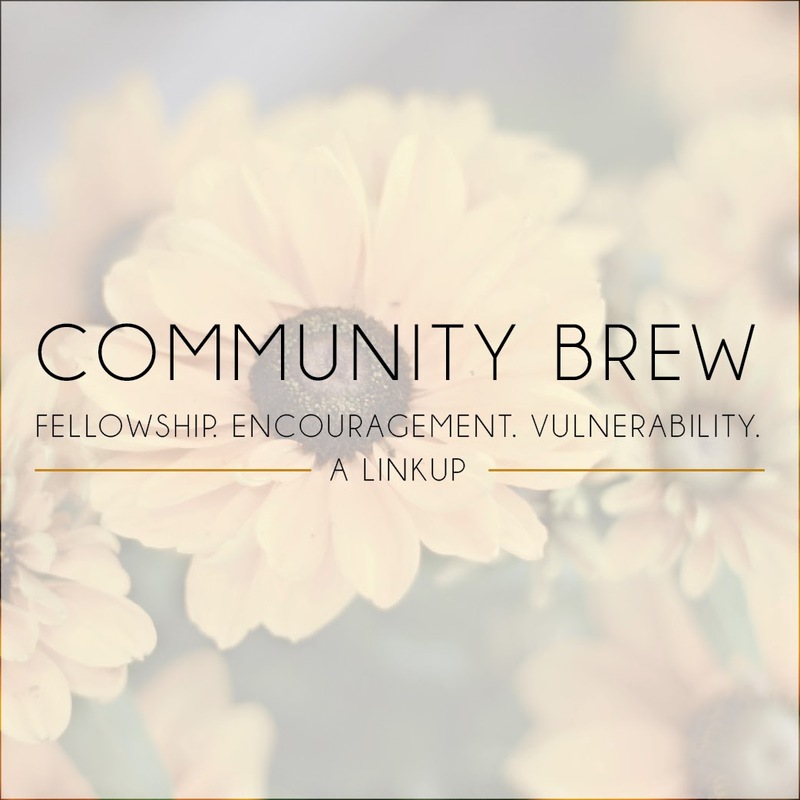 "When those that do not know the Lord step into a community that loves each other in the messes of life, they become curious because this kind of community is not common. So praise JESUS, community gives us a chance to make his name known!" Can we get an Amen?!? Since Sean and I were married last year, I immediately started learning all about community within the home. Opening the doors to friends and family whenever they would like to stop in to say hello, stay for dinner or stay the night. Well, to me, this meant the house had to be 110% perfect. Talk about a huge struggle. One night I was painting and the house was literally a wreck. Furniture was moved all over the place, dishes were piled up and laundry was overflowing my laundry room. Well, we had family members stop by and I literally thought I was going to have a meltdown. I am not sure if it is a Southern hospitality thing or just a girl thing, but I DO NOT want my house anything but perfect when people come by. So yes, that is a struggle. I absolutely love having others in out home but rather than this perfect home and just "hosting" others, I need to let them see the real me. If someone needs to come to our home to vent and just talk about a horrible day, I need to focus my attention on helping others, on building that community. Not on how horrible the house may be. How do you feel about community? What are ways you think community can be built? And as always, thank you to the lovely Rachel and Madison for hosting yet another fabulous coffee date! Love this post and your view of community! I used to go to Highpoint before I started going to Brunswick Baptist. Small world! :) Love that church. Their mission is definitely community! Love hearing from you Lauren! I am so glad that you are enjoying your church so much and that it's been such a blessing in your life! I think you are so right in saying that community is all about opening up and being true to who you are, and not dwelling in some facade of what you hope others will think of you.....that may seem like a good idea- but really just makes for a lot of shallow relationships. Thanks for the encouragement lady! I love your thoughts about why community is hard. You're so right-- community is not always pretty and it does mean being open. That is such a challenge for all of us. I am the same way with my house, I'm terrified of a less than perfect house for guests. But being that way doesn't allow spontaneity or drop ins. And sometimes that's what Jesus wants from me. Thank you so much for linking up with us sweet friend! Amen my dear, I am right there with you on fighting the urge to show your "perfect" self...it is truly a challenge to let our guard down and allow people to come in to who we really are in our messes. But it is always such an unexpected joy when people accept and love us in the midst of the craziness! Ya know? So glad you linked up with us!! !